Being a fairly pale girl means suncream is pretty much my best friend. I like to wear an SPF of at least 30 on my face every single day (yes, even in the winter), and try to always remember to smother myself in the stuff when I'm outside and the sun is shining. So, having said this, it's safe to say I've tried a fair few suncreams in my life, but I think I'm finally settled on which ones work best for me. 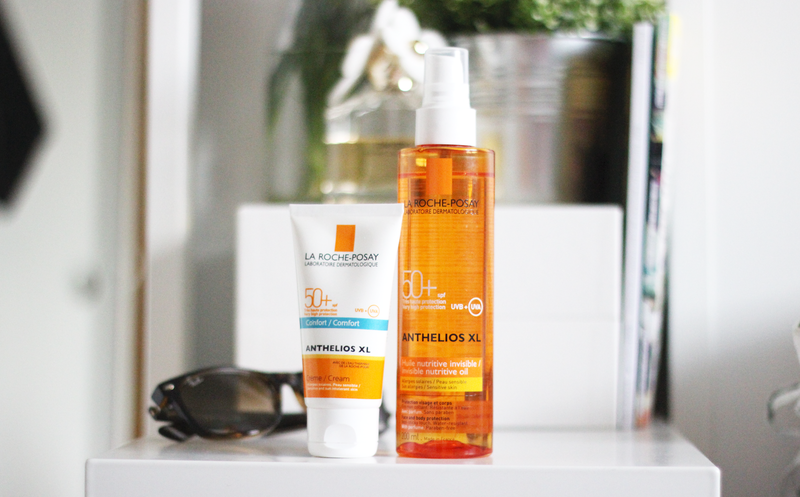 The La Roche-Posay Anthelios XL suncreams are truly wonderful - a reasonably priced offering of various different formulas for the face and body. So really, it's no surprise that both of my favourites originate from this range. The Invisible Nutritive Oil SPF 50+ is one I picked up last summer after Emma's recommendation. I managed to grab this in the 25% off offer at the time, and have been very pleased with it. (This is my second bottle!) It's a lovely lightweight oil with high protection, and packaging that makes sense. It doesn't spray everywhere like with most other suncreams, instead it *pumps* out a little at a time, ensuring you don't waste any product during application. And does it work? Yes. I forgot to use this during a trip to the beach a few weeks ago, and was greeted with red itchy skin later that evening. I completely forgot how horrible sunburn can be, as it's been so long since I last burnt. I will be keeping a tight grip on this bottle from now on! Face-wise, I actually jump between two of LRP's offerings. One being the 'Comfort Cream*,' and the other, the 'Dry Touch Gel-Cream'. Both offer SPF 50+ protection and come in the same 50ml tube. I can't say I prefer one over the other, as they both work wonderfully under makeup, and are quite similar really. I would say I prefer the Comfort in the winter months as it is a little more moisturising, and perhaps the Dry Touch in the warmer weather as I'm more likely to go makeup free, and I quite like the slight mattifying effect this product offers. The whole Anthelios range is currently 25% off at Boots again, so now's the time to stock up!